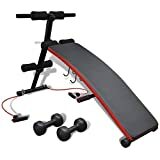 This high quality multifunctional sit up bench, with 2 dumbbells and 2 training ropes, will be a great help to you when training a wide variety of muscles. This versatile fitness workout bench allows for an effective, total body workout. Equipped with many adjustable knobs, the bench provides you with a great range of adjustment angles and heights; it therefore allows you to choose your desired position .The provided dumbbells and training ropes also help to exercise your chest and arms. It is equipped with a comfortable padded cushion. The heavy duty steel frame makes it stable and durable. Delivery includes 1 sit up bench, 2 dumbbells and 2 training ropes.